Q1What is the basic view of the Government of Japan on the Senkaku Islands? Q2What are the grounds for Japan's territorial sovereignty over the Senkaku Islands? Q3What are the concrete examples of Japan's valid control over the Senkaku Islands? Q4What is the view of the Government of Japan on China's (and Taiwan's) assertions on territorial sovereignty over the Senkaku Islands? Q5The Chinese government asserts that the Senkaku Islands had not been terra nullius (“land belonging to no state”) as Japan claims, but that they have been an inherent part of the territory of China from ancient times; that they had been discovered, named and used by the Chinese nationals before anyone else, according to historical documents; that Chinese fishermen had engaged in fishing and other productive activities in this sea zone; and that people along China’s southeast coast had been using Uotsuri Island as a navigation beacon. It also asserts that during the Ming Dynasty, the islands were already discovered and recognized by imperial envoys of China and that these islets belonged to Taiwan, which was included in China’s maritime defense zone. What is the view of the Japanese government? Q6The Chinese government asserts that maps compiled in China or in foreign countries, including Japan, before the 1800s show that the Senkaku Islands belonged to China. What is the view of the Japanese government? Q7The Chinese government claims that Japan stole the Senkaku Islands during the Sino-Japanese War. The Chinese government also asserts that Taiwan, all the islands appertaining to it and the Pescadores were later ceded to Japan under an unequal treaty, "the Treaty of Shimonoseki," after the Sino-Japanese War, and were incorporated into the territory of Japan. What is the view of the Japanese government? Q8The Chinese government, referring to a letter sent in 1885 by the then Japanese foreign minister to the then interior minister, claims that the Meiji government acknowledged the Senkaku Islands were the territory of China before being incorporated into Okinawa Prefecture. What view does the Japanese government have? Q9 In incorporating the Senkaku Islands in 1895, did Japan make a thorough survey? Q10The Japanese government never made public the Cabinet Decision made in 1895, keeping it secret, didn't it? Q11The Chinese government asserts that as a result of Japan’s acceptance of the “Cairo Declaration” of 1943 and the subsequent “Potsdam Declaration” of 1945, the Senkaku Islands, as islands appertaining to Taiwan, reverted to China along with Taiwan. It also asserts that the Nansei Shoto Islands which had been placed under the administration of the United States under the terms of the San Francisco Peace Treaty, which was concluded while excluding China, had not included the Senkaku Islands, that the Government of the United States in December 1953 announced the “geographic boundaries of the Ryukyu Islands” and unilaterally expanded the scope of jurisdiction of the United States, that when it reverted the rights of administration of Okinawa to Japan in 1971, it included the Senkaku Islands in the territory to be reverted to Japan, and that the Chinese government has never recognized the Senkaku Islands as territory of Japan. What is the view of the Japanese government? Q12Taiwan (the Republic of China) aside, wasn’t China (the People’s Republic of China) against the treatment of the Senkaku Islands in the San Francisco Peace Treaty? Q13The Chinese government claims that Japan's stance and approach on the Senkaku islands constituted outright denial of victorious World War II outcomes against fascism and poses a grave challenge to postwar international order and the purposes and principles of the U.N. Charter. How does the Japanese government respond to that? Q14The Chinese government claims that in the process of negotiations leading up to the normalization of Japan-China relations in 1972 and the concluding of the bilateral Treaty of Peace and Friendship in 1978, “the leaders of the two reached an important understanding and mutual recognition about shelving the issue of the Senkaku Islands and leaving it for solution in future.” How does the Japanese government respond to that? Q15Q15　What has been the position of the Government of the United States on the Senkaku Islands? Q16China has strongly objected to the Japanese government’s acquisition of the ownership of three Senkaku islands in September 2012. How does the Japanese government view such objection? A1There is no doubt that the Senkaku Islands are clearly an inherent territory of Japan, in light of historical facts and based upon international law. Indeed, the Senkaku Islands are under the valid control of Japan. There exists no issue of territorial sovereignty to be resolved concerning the Senkaku Islands. The Senkaku Islands were not included in the territory which Japan renounced under Article 2 of the San Francisco Peace Treaty of 1951 that legally defined the territory of Japan after World War II. Under Article 3 of the treaty, the islands were placed under the administration of the United States as part of the Nansei Shoto Islands. The Senkaku Islands are included in the areas whose administrative rights were reverted to Japan in accordance with the Agreement between Japan and the United States of America Concerning the Ryukyu Islands and the Daito Islands that entered into force in 1972. The Senkaku Islands have historically and consistently been part of the Nansei Shoto Islands which have been part of the territory of Japan. 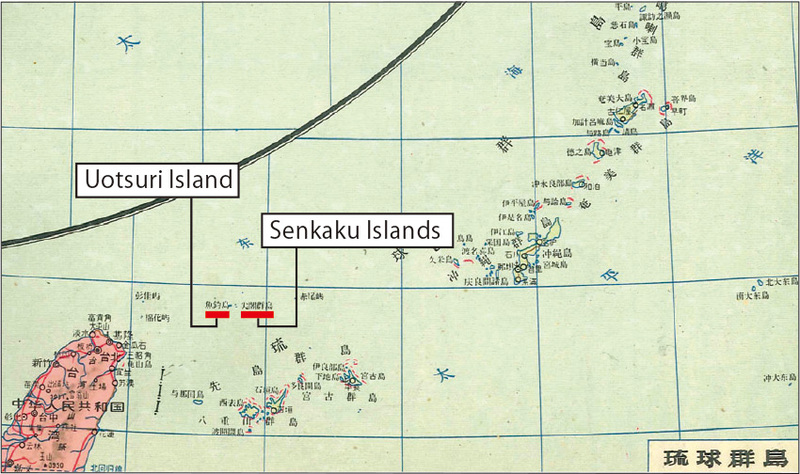 From 1885, surveys of the Senkaku Islands had been thoroughly conducted by the Government of Japan through the agencies of Okinawa Prefecture and through other means. Through these surveys, it was confirmed that the Senkaku Islands had been not only uninhabited but also showed no trace of having been under the control of the Qing Dynasty of China. Based on this confirmation, the Government of Japan made a Cabinet Decision on January 14, 1895, to erect markers on the islands to formally incorporate the Senkaku Islands into the territory of Japan. These measures were carried out in accordance with the internationally accepted means of duly acquiring territorial sovereignty under international law (occupation of terra nullius). The Senkaku Islands are not part of Formosa (Taiwan) and the Pescadores Islands that were ceded to Japan from the Qing Dynasty in accordance with Article II of the Treaty of Shimonoseki, concluded in April 1895. Japan will concur in any proposal of the United States to the United Nations to place under its trusteeship system, with the United States as the sole administering authority, Nansei Shoto south of 29° north latitude (including the Ryukyu Islands and the Daito Islands), Nanpo Shoto south of Sofu Gan (including the Bonin Islands, Rosario Island and the Volcano Islands) and Parece Vela and Marcus Island. Pending the making of such a proposal and affirmative action thereon, the United States will have the right to exercise all and any powers of administration, legislation and jurisdiction over the territory and inhabitants of these islands, including their territorial waters. 2. For the purpose of this Agreement, the term "the Ryukyu Islands and the Daito Islands" means all the territories and their territorial waters with respect to which the right to exercise all and any powers of administration, legislation and jurisdiction was accorded to the United States of America under Article 3 of the Treaty of Peace with Japan other than those with respect to which such right has already been returned to Japan in accordance with the Agreement concerning the Amami Islands and the Agreement concerning Nanpo Shoto and Other Islands signed between Japan and the United States of America, respectively on December 24, 1953 and April 5, 1968. It is confirmed that treaties, conventions and other agreements concluded between Japan and the United States of America, including, but without limitation, the Treaty of Mutual Cooperation and Security between Japan and the United States of America signed at Washington on January 19, 1960 and its related arrangements and the Treaty of Friendship, Commerce and Navigation between Japan and the United States of America signed at Tokyo on April 2, 1953, become applicable to the Ryukyu Islands and the Daito Islands as of the date of entry into force of this Agreement. A resident of Okinawa Prefecture who had been engaging in activities such as fishery around the Senkaku Islands since around 1884 made an application for the lease of the islands, and approval was granted by the Meiji Government in 1896. After this approval, he sent workers to those islands and ran the following businesses: collecting bird feathers, manufacturing dried bonito, collecting coral, raising cattle, manufacturing canned goods and collecting mineral phosphate guano (bird manure for fuel use). The fact that the Meiji Government gave approval concerning the use of the Senkaku Islands to an individual, who in turn was able to openly run these businesses mentioned above based on the approval, demonstrates Japan's valid control over the Islands. Before World War II, the Central Government and the Government of Okinawa Prefecture conducted activities such as field surveys on the Senkaku Islands. After World War II, as the Senkaku Islands had been placed under the administration of the United States as part of Nansei Shoto in accordance with Article 3 of the San Francisco Peace Treaty, Japan could not exercise direct control over the Islands until the administrative rights were reverted to Japan on May 15, 1972. However, even during this period, the Islands remained as part of the territory of Japan, and this legal status of the Islands, which was that no foreign state had rights over them, with the only exception of the administrative rights which the United States was authorized to exercise over the Islands under the San Francisco Peace Treaty, was ensured through the valid control by the United States Civil Administration of the Ryukyu Islands and the Government of the Ryukyu Islands. The following are some examples of valid control after the reversion to Japan of the administrative rights over Okinawa including the Senkaku Islands. (4) As for Kuba Island and Taisho Island, the Government of Japan has offered them to the United States since 1972 as facilities/districts in Japan under the Japan-U.S. Status of Forces Agreement. (5) Researches by the Central Government and the Government of Okinawa Prefecture (e.g. Utilization and development research by Okinawa Development Agency (construction of temporary heliport, etc.) (1979), Fishery research by the Okinawa Prefecture (1981), Research on albatrosses commissioned by the Environment Agency (1994).). None of the points raised by the Government of China and the Taiwanese authorities as historical, geographical or geological evidences provide valid grounds in light of international law to support their sovereignty over the Islands. Moreover, it is only since the 1970s that the Government of China and the Taiwanese Authorities began making their own assertions about the Senkaku Islands, which was after a survey conducted by an agency of the United Nations in autumn of 1968 had indicated the possibility of the existence of petroleum resources on the East China Sea, and attention was focused on the Senkaku Islands. Until then, they had never expressed any objections, including to the fact that the Islands were included in the area over which the United States exercised the administrative rights in accordance with Article 3 of the San Francisco Peace Treaty. China has never explained why it had not expressed objections. There is a description of "the Senkaku Islands, Yaeyama District, Okinawa Prefecture, Empire of Japan" in the letter of appreciation dated May 1920 sent from the then consul of the Republic of China in Nagasaki concerning the distress which involved Chinese fishermen from Fujian Province around the Senkaku Islands. 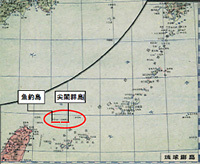 In addition, an article in the People's Daily dated January 8, 1953, under the title of "Battle of people in the Ryukyu Islands against the U.S. occupation", made clear that the Ryukyu Islands consist of 7 groups of islands including the Senkaku Islands. Moreover, in a world atlas collection published in 1958 by a Chinese map-publishing company (reprinted in 1960), there is a clear description of the Senkaku Islands as the “Senkaku Group of Islands” and it treats them as part of Okinawa. Furthermore, from the 1950s onward, the U.S. military used some of the Senkaku Islands (Taisho Island and Kuba Island) as firing/bombing ranges while the islands were under the administration of the United States, but there is no record of China ever having protested it during that period. In the autumn of 1968, an academic survey conducted by experts of Japan, Taiwan and Korea with the cooperation of the United Nations Economic Commission for Asia and the Far East (ECAFE) indicated the possibility of the existence of petroleum resources on the East China Sea, and attention was focused on the Senkaku Islands. In the winter of the 8th year (1919) of the Republic of China, 31 fishermen from Hui'an Country, Fujian Province were lost due to the stormy wind and were washed ashore on the Wayo Island, of the Senkaku Islands, Yaeyama District, Okinawa Prefecture, Empire of Japan. "The Ryukyu Islands lie scattered on the sea between the Northeast of Taiwan of our State (note: China; same in the following text) and the Southwest of Kyushu, Japan. They consist of 7 groups of islands; the Senkaku Islands, the Sakishima Islands, the Daito Islands, the Okinawa Islands, the Oshima Islands, the Tokara Islands and the Osumi Islands. Each of them consists of a lot of small and large islands and there are more than 50 islands with names and about 400 islands without names. Overall they cover 4,670 square kilometers. The largest of them is the Okinawa Island in the Okinawa Islands, which covers 1,211 square kilometers. The second largest is the Amami Oshima Island in the Oshima Islands (the Amami Islands), which covers 730 square kilometers. The Ryukyu Islands stretch over 1,000 kilometers, inside of which is our East China Sea (the East Sea in Chinese) and outside of which is the high seas of the Pacific Ocean." This was published by a Chinese map-publishing company in 1958. It clearly identifies the Senkaku Islands as “the Senkaku Group of Islands” and treats them as part of Okinawa. China claims that this atlas collection has a note saying that "part of the national border with China is based on an atlas made before the anti-Japanese war (that is, when Taiwan was a Japanese colony)"and that the content of this atlas published in 1958 does not support the argument that the Chinese government at the time recognized Japanese control of Senkaku Islands. However, the original text of the note only states that “the national border of China in this atlas was drawn based on an atlas of the Shen Bao daily (Chinese newspaper in those days) before the liberation from Japanese occupation (Chinese text: 本図集中国部分的国界線根据解放前申報地図絵制).” It is not clear which part specifically is the portion before the liberation. In this atlas, Taiwan is identified as part of the “People’s Republic of China” whereas the Senkaku Islands are identified as “the Senkaku Group of Islands”. It is unnatural that China remained to use the expression from the period when Taiwan was a colony of Japan only for the Senkaku Islands which China argues it belongs to Taiwan. Q5The Chinese government asserts that the Senkaku Islands had not been terra nullius (“land belonging to no state”) as Japan claims, but that they have been an inherent part of the territory of China from ancient times; that they had been discovered, named and used by the Chinese nationals before anyone else, according to historical documents; that Chinese fishermen had engaged in fishing and other productive activities in this area; and that people along China’s southeast coast had been using Uotsuri Island as a navigation beacon. It also asserts that during the Ming Dynasty, the islands were already discovered and recognized by imperial envoys of China and that these islets belonged to Taiwan, which was included in China’s maritime defense zone. What is the view of the Japanese government? Japan incorporated the Islands into Okinawa Prefecture after conducting thorough surveys from 1885 , while ascertaining carefully that these islands had not only been uninhabited but also showed no trace of having been under a control of any state including China. (i) China asserts as follows: The Records of the Imperial Title-Conferring Envoys to Ryukyu (Shi Liu Qiu Lu) (1534) written by Chen Kan, an imperial title-conferring envoy from the Ming Court, clearly states that “the ship has passed Diaoyu Yu, Huangmao Yu, Chi Yu…Then Gumi Mountain comes into sight, that is where the land of Ryukyu begins” and, since “Gumi Mountain” is the present Kume Island, it means that the Senkaku Islands, located west of Kume Island, were the territory of China. China also asserts that in his book Records of Messages from Chong-shan (Zhong Shan Chuan Xin Lu) (1719), Xu Baoguang states that ”Mt. Gumi is the mountain guarding the southwest border of Ryukyu" and that this is also the ground for its assertion that the area west of Kume Island had belonged to China. However, although these documents showed that Kume Island belonged to Ryukyu, they did not have any reference that the Senkaku Islands, located to the west of Kume Island, belonged to the Ming or Qing Dynasty of China. (ii) China also asserts that An Illustrated Compendium on Maritime Security (Chou Hai Tu Bian) (1561) compiled by Hu Zongxian included the Senkaku Islands on the “Map of Coastal Mountains and Sands” (Yan Hai Shan Sha Tu) and that these groups of islands were incorporated into the jurisdiction of the coastal defense of the Ming Court. The book, however, is not clear regarding whether these groups of islands were within the coastal defense of the Ming Court. The mere fact that the Senkaku Islands were printed on that map does not mean that they were generally regarded as territory of China at that time. (i) From the 1950s onward, the U.S. military used part of the Senkaku Islands (Taisho Island and Kuba Island) for firing/bombing ranges while the islands were under the administration of the United States, but there is no record of China ever having protested it during that period. (ii) There is a description of "the Senkaku Islands, Yaeyama District, Okinawa Prefecture, Empire of Japan" in a letter of appreciation dated May 1920 and sent from the then consul of the Republic of China in Nagasaki concerning the distress around the Senkaku Islands that involved Chinese fishermen from Fujian Province. 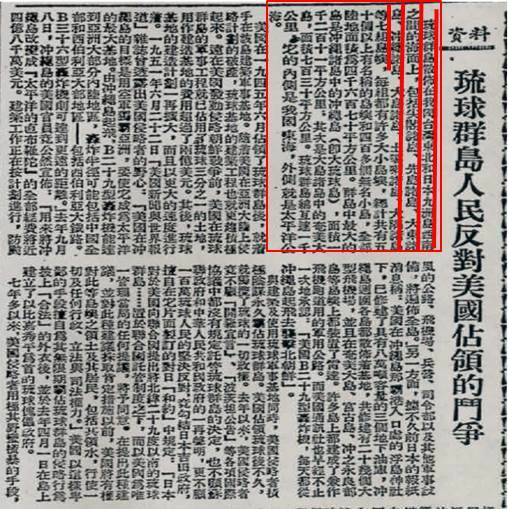 (iii) An article in the People's Daily dated January 8, 1953, under the title of "Battle of People in Ryukyu Islands against U.S. Occupation," wrote that the Ryukyu Islands consisted of seven groups of islands including the Senkaku Islands. (iv) Moreover, the "World Atlas Collection" published by a Chinese map-publishing company in 1958 (reprinted in 1960) clearly identified the Senkaku Islands as "the Senkaku Group of Islands" and treated them as part of Okinawa. Intended purposes of maps and compilers of maps vary and the existence of a map in itself does not evidence the assertion of territorial sovereignty. From 1885, the Government of Japan thoroughly conducted surveys of the Senkaku Islands through the agencies of Okinawa Prefecture and by way of other methods. Through these surveys, it was confirmed that the Senkaku Islands had been not only uninhabited but showed no trace of having been under the control of the Qing Dynasty of China. Based on this confirmation, the Government of Japan made a Cabinet Decision on January 14, 1895, to erect markers on the islands to formally incorporate the Senkaku Islands into the territory of Japan. Meanwhile, no valid ground under international law has been shown to support that China had established sovereignty over the Senkaku Islands before Japan incorporated them into its territory in 1895. It is only since the 1970s that the Chinese government began to make its own assertions over the Senkaku Islands. The map in the Illustrated Outline of the Three Countries (1785) by Hayashi Shihei, which China cites as one of examples supporting its assertion, is not clear as to whether it was intended to draw the recognition of territories of that time. To begin with, it does not evidence accurate knowledge as shown by the fact, for instance, the size of Taiwan in the map is only about one-third of that of Okinawa’s main island. Although the Treaty of Shimonoseki does not clearly define the geographical limits of the island of Formosa and the islands appertaining or belonging to Formosa ceded to Japan by the Qing Dynasty of China, nothing in the negotiation history (or otherwise) supports the interpretation that the Senkaku Islands are included in the island of Formosa and the islands appertaining or belonging to it in Article 2b of the Treaty. Furthermore, Japan had already undertaken preparation, from 1885, even before the Sino-Japanese War, to formally incorporate the Senkaku Islands into the territory of Japan while carefully ascertaining that no state including the Qing Dynasty of China had control over the Islands. Following the Cabinet Decision in January 1895, which was made before the concluding of the Treaty of Shimonoseki, the Government of Japan incorporated the Senkaku Islands into Okinawa Prefecture and consistently treated the Islands as part of Okinawa Prefecture, not as an area under the jurisdiction of the Governor-General of Taiwan which was ceded to Japan after the Sino-Japanese War. These facts make it clear that, both before and after the Sino-Japanese War, the Government of Japan has never regarded or treated the Senkaku Islands as part of the island of Taiwan or islands appertaining or belonging to the island of Taiwan, which had been part of the Qing Dynasty of China. Thus, it is evident that the Senkaku Islands could never have been part of the cession made under the Treaty of Shimonoseki. Moreover, it was recognized in the Sino-Japanese Peace Treaty of 1952 that Japan renounced all right, title and claim to Taiwan, the Pescadores and other islands under Article 2 of the San Francisco Peace Treaty. Against the above background, however, there was absolutely no discussion on territorial sovereignty over the Senkaku Islands in the process of negotiations for the Sino-Japanese Peace Treaty. What this means is that it was considered as the rightful premise that the Senkaku Islands were the territory of Japan from before that time. The foreign minister's letter in 1885 does constitute one document of the process up to the incorporation of the islands and it is true that it referred to the attitude of the Qing Dynasty. However, it is impossible to interpret it as the acknowledgement by the Government of Japan that the Qing Dynasty held the Senkaku Islands as its territory. 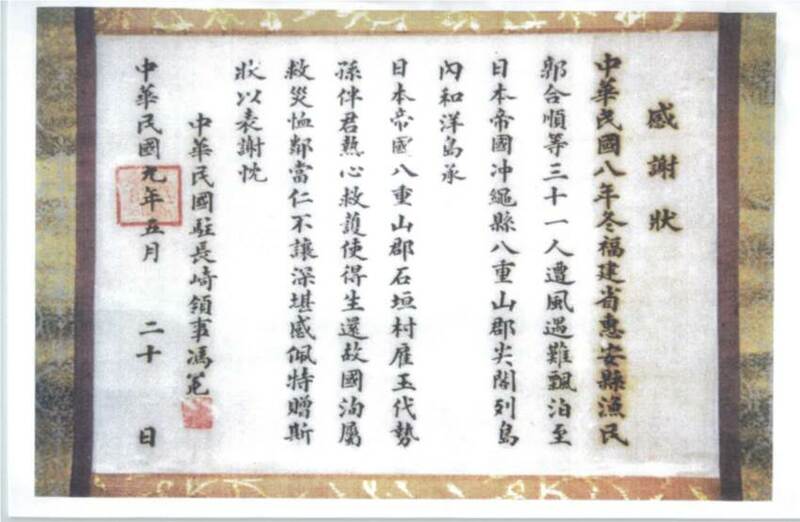 Rather, the document shows how Japan proceeded with the process of incorporation carefully and cautiously on the premise that the Senkakus did not belong to Qing Dynasty. The fact that the foreign minister in his letter supported an on-site survey clearly shows that Japan did not consider the Senkaku Islands as the territory of the Qing Dynasty. Moreover, in his letter to the foreign minister in 1885, the interior minister said to the effect that the Senkaku Islands showed no trace of having been under the control of the Qing Dynasty. "Concerning the aforementioned islands (note: Senkaku Islands), they are in proximity to the national border with the Qing Dynasty, their circumferences appear smaller than those of the Daito Islands, where our on-site survey had been already completed and in particular, their names are being attached by the Qing Dynasty. There are rumors recently circulated by Qing newspapers and others, including one that say our government is going to occupy the islands in the vicinity of Taiwan that belong to the Qing Dynasty, which are arousing their suspicions towards our country and frequently alerting the Qing government for caution. If we promptly took measures such as publicly erecting national markers, it would result in making the Qing Dynasty suspicious. Therefore, we should have the islands surveyed and details — such as the configuration of harbors and the prospect of land development and local production — reported and stop there. We should deal with the erection of national markers, land development and other undertakings some other day." "(Preliminary portion omitted) Draft report to the Grand Council of State Concerning investigation into the uninhabited Kumeakashima and two other islands dotted between Okinawa Prefecture and Fuzhou of the Qing Dynasty, the prefectural governor submitted a report as per the document attached (note: a report submitted by the governor of Okinawa to Interior Minister Yamagata on September 22, 1885, Appendix 2). The aforementioned islands appear to be identical with the islands reported in the Records of Messages from Chong-shan, but they were mentioned as a mere direction in the course of voyage and showed no particular trace of having been under the control of the Qing Dynasty while the islands' names were different between them and us. They belong to the uninhabited islands near Miyako, Yaeyama and others under the control of Okinawa and, therefore, there should be no problem with the prefecture surveying them and erecting national markers on them." Q9In incorporating the Senkaku Islands in 1895, did Japan make a thorough survey? From 1885, surveys of the Senkaku Islands had been thoroughly made by the Government of Japan through the agencies of Okinawa Prefecture and by way of other methods. Through these surveys, it was confirmed that the Senkaku Islands had not only been uninhabited but showed no trace of having been under the control of the Qing Dynasty of China. Based on this confirmation, the Government of Japan made a Cabinet Decision on January 14, 1895, to erect markers on the islands to formally incorporate the Senkaku Islands into the territory of Japan. These measures were carried out in accordance with the ways of duly acquiring territorial sovereignty under international law (occupation of terra nullius). Other key facts concerning Japan’s preparations for the territorial incorporation prior to the Sino-Japanese War include: (1) according to reports submitted on September 22 and November 5, 1885, by the governor of Okinawa Prefecture to the interior minister, surveys of the Senkaku Islands were conducted by Okinawa Prefecture on the order of the Interior Ministry, including an investigation by patrol boat in late October 1885 aboard the Izumo Maru chartered from Nippon Yusen and a report was subsequently submitted to the central government, and (2) according to the departure and arrival records of the warship “Kongo” in 1887, the ship sailed from Naha in June that year toward the Sakishima Group of Islands (in the direction of the Senkaku Islands) with Navy Lieutenant Kato, chief of a survey team in the Waterways Department, aboard. “Nihon Suiro Shi” (Japan Waterways Journal) (published in 1894) and other publications carry outlines of Uotsuri Island and others as based on Lieutenant Kato’s writings on experiments (records based on on-site surveys) in 1887 and 1888. It is true that the Cabinet Decision of 1895 was not made public, but it is understood that so were Cabinet decisions in general at that time. After the aforementioned Cabinet Decision, Japan openly exercised its sovereignty over the Senkaku Islands, including the issuance of permits to petitions for land tenancy and field surveys by the central government and the government of Okinawa Prefecture, making it externally known that Japan had an intention to possess the sovereignty of the islands. Under international law, there is no obligation to notify other countries of a government intention to occupy terra nullius. The Cairo Declaration and the Potsdam Declaration were documents that stipulated the basic postwar settlement policy of the Allied powers. There is no evidence that shows that the Allied powers, including the Republic of China, recognized that the Senkaku Islands were included among “the islands appertaining to Formosa (Taiwan)” as stated in the Cairo Declaration in these declarations. In any event, the disposition of territories as a result of a war is ultimately settled by international agreements such as peace treaties. In the case of World War II, the San Francisco Peace Treaty legally defined the territory of Japan after the war. Neither the Cairo Declaration nor the Potsdam Declaration had the ultimate legal validity on the treatment of Japan’s territory. In accordance with Article 2 (b) of the San Francisco Peace Treaty, Japan renounced territorial sovereignty over Formosa (Taiwan) and the Pescadores, which had been ceded by China after the Sino-Japanese War. However, the Senkaku Islands were not included in “Formosa and the Pescadores” as stated in the treaty. It is because under Article 3 of the San Francisco Peace Treaty, the United States actually exercised the rights of administration on the Senkaku Islands as part of the Nansei Shoto Islands. They are also explicitly included in the area whose administrative rights were reverted to Japan when Okinawa was reverted to Japan in 1972. When the San Francisco Peace Treaty was concluded, the Senkaku Islands were left as territory of Japan. However, none of the major Allied powers concerned — the United States, the United Kingdom, France and China (the Republic of China and the People’s Republic of China) — raised objections.. Rather, in a People’s Daily article headlined “Battle of People in Ryukyu Islands against U.S. Occupation,” dated January 8, 1953, China criticized the United States for occupying the Ryukyu Islands which were not decided in either the Cairo Declaration or the Potsdam Declaration to be put under trusteeship, against the will of the local people. 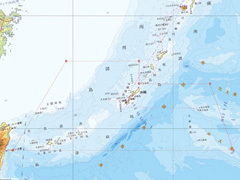 The article stated that the Ryukyu Islands comprised of seven groups of islands, including the Senkaku Islands, which recognizes that the Senkaku Islands were part of the Ryukyu Islands. Although China was not a signatory to the San Francisco Peace Treaty, Japan signed the Sino-Japanese Peace Treaty with the Republic of China (Taiwan), which Japan then recognized as the government of China. The Sino-Japanese Peace Treaty approved that Japan had renounced all right, title and claim to Taiwan, the Pescadores, etc., in accordance with Article 2 of the San Francisco Peace Treaty, but during the process of negotiations for this treaty, the Senkaku Islands, whose status as Japanese territory was left untouched, were never taken up for discussion. What this means is that it was considered to be the rightful premise that the Senkaku Islands were the territory of Japan from before that time. As a result of a survey conducted in the autumn of 1968 by an agency of the United Nations that indicated the possibility of the existence of petroleum resources in the East China Sea, attention was focused on the Senkaku Islands. It was only in the 1970s that the Chinese government and the authorities in Taiwan began to make their own assertions. Prior to that, they had never objected the fact that the Senkaku Islands were included in the area that was placed under the administration of the United States in accordance with Article 3 of the San Francisco Peace Treaty. The Chinese government has never clearly explained why it did not lodge objections to this fact. The treatment of the Sankaku Islands after the conclusion of the San Francisco Peace Treaty was public knowledge internationally, and the People’s Republic of China can in no way claim that it did not know this at the time. 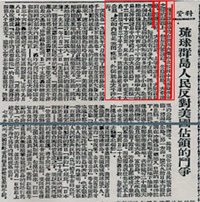 In fact, an article dated January 8, 1953, in the People’s Daily, which is an organ of the Communist Party of China, under the headline “Battle of People in Ryukyu Islands against U.S. Occupation,” explicitly included the Senkaku Islands among the Ryukyu Islands, which were under the administration of the United States. Subsequently, the People’s Republic of China did not make any objections until the 1970s to the fact that the area placed under the U.S. administration in accordance with Article 3 of the San Francisco Peace Treaty included the Senkaku Islands. China has not explained at all why it did not object. The objectives of the participating countries (note: the United States of America, the United Kingdom and the Republic of China) are to strip Japan of all islands she has seized or occupied in the Pacific since the beginning of World War I in 1914 and to restore to the Republic of China all the territories Japan has stolen from the Qing Dynasty of China such as Manchuria, Formosa (Taiwan) and the Pescadores. 8. The Cairo Declaration shall be implemented and Japanese sovereignty shall be limited to the islands of Honshu, Hokkaido, Kyushu, Shikoku, and such minor islands as we determine. Q13 The Chinese government claims that Japan's stance and approach on the Senkaku islands constitutes outright denial of victorious World War II outcomes against fascism and poses a grave challenge to postwar international order and the purposes and principles of the U.N. Charter. How does the Japanese government respond to that? Japan's acquisition of sovereignty over the Senkaku Islands has nothing to do with World War II. The San Francisco Peace Treaty and related treaties, which legally defined Japan's territory after World War II, did so on the premise that the Senkaku Islands were part of Japanese territory. Before the decision was made based on the San Francisco Peace Treaty, neither China nor Taiwan had claimed sovereignty over the Senkaku Islands. However, as the Senkaku Islands began to draw attention following an academic survey in the fall of 1968 which indicated the possibility of the existence of petroleum resources in the East China Sea, the Chinese government and Taiwan authorities began to make their own assertions about territorial sovereignty over the Senkaku Islands in the 1970s. Moreover, in an attempt to justify its own assertion, China abruptly began to argue about "the outcomes of the World War II" as if Japan was distorting the international framework after World War II. It is Chinese actions, however, that pose a grave challenge to the post-war international order by objecting the decisions based on the San Francisco Peace Treaty, the very international framework that decided the outcomes of World War II concerning Japan. Moreover, the attitude to easily attribute the difference of opinions to the past war is an act of evasion from the essence of the issue. We view that such attitude is not just unconvincing, but it is also very counterproductive. In fact, the Chinese side, in the Japan-China Joint Statement signed in May 2008 by the leaders of Japan and China, expressed its "positive evaluation of Japan's consistent pursuit of the path of a peaceful country and Japan's contribution to the peace and stability of the world through peaceful means over more than 60 years since World War." China can never deny the justifiable claim of Japan, which has spent half a century after the war as a peace-loving country, by just arguing about "the outcomes of World War II" nor justify its own assertion concerning the Senkaku Islands. There is no doubt, in light of historical facts and based upon international law, that the Senkaku Islands are an inherent part of the territory of Japan. Indeed, the Senkaku Islands are under the valid control of Japan. To begin with, there exists no issue of territorial sovereignty to be resolved concerning the Senkaku Islands. Japan's position as stated above has been consistent and it is not true that there was an agreement with the Chinese side about "shelving" or "maintaining the status quo" regarding the Senkaku Islands. This is clearly shown in the published record of the Japan-China Summit Meeting held on the occasion of the normalization of bilateral diplomatic relations. Japan has pointed out its position to the Chinese side clearly and time and again. Prime Minister Tanaka: What is your view on the Senkaku Islands? Some people say things about them to me. Premier Zhou: I do not want to talk about the Senkaku Islands this time. It is not good to to discuss this now. It became an issue because of the oil out there. If there wasn’t oil, neither Taiwan nor the United States would make this an issue. Reporter: The Senkaku Islands are Japan’s inherent territory, and I feel the recent trouble is a matter for regret. What is the view of the Deputy Premier? Vice Premier Deng: We refer to the Senkaku Islands as the Diaoyu. Even our nomenclature is different. Certainly there are differences of opinion between us on this issue but when we normalized diplomatic relations between our two countries, both parties promised to leave the issue aside. At this time of negotiation on Treaty of Peace and Friendship, we agreed to leave the issue aside in much the same way. Based on Chinese wisdom, this is the only idea we have. If we delve into the subject, it becomes difficult to say something clearly. Certainly there are some people that want to use this issue to throw cold water onto China-Japan relations. Therefore, I think it is better to avoid the issue when our countries have negotiations. Even if this means the issue is temporarily shelved, I don’t think I mind. I don’t mind if it’s shelved for ten years. The people of our generation don’t have sufficient wisdom to settle this discussion, but the people of the next generation will probably be wiser than us. At that time, a solution that everyone can agree on will probably be found. Q15What has been the position of the United States Government on the Senkaku Islands? Since the end of World War II, the Senkaku Islands were placed under the administration of the United States of America as part of the Nansei Shoto Islands in accordance with Article 3 of the San Francisco Peace Treaty. With the entry into force in 1972 of the Agreement between Japan and the United States of America Concerning the Ryukyu Islands and the Daito Islands (the Okinawa Reversion Agrement), the administrative rights over the Senkaku Islands were reverted to Japan. As is clearly expressed in a statement issued by Secretary of State Dulles at the San Francisco Peace Conference and in the Joint Communique of Japanese Prime Minister Kishi and U.S. President Eisenhower issued on Jun 21, 1957, the U.S. Government did recognize Japan’s “residual sovereignty” over the Nansei Shoto Islands. Furthermore, in connection with the application of Article 5 of the Treaty of Mutual Cooperation and Security between Japan and the United States of America (the Japan-U.S. Security Treaty), the U.S. government has made it clear that the Senkaku Islands have been under the administration of the Government of Japan since their reversion to Japan as part of the Okinawa reversion in 1972 and that the Japan-U.S. Security Treaty applies to the Senkaku Islands. Regarding Kuba Island and Taisho Island, which are both part of the Senkaku Islands, even though China had already started claiming its sovereignty over the Senkaku Islands, about the Senkaku islands there has been no change in the status of the two islands as facilities and areas within Japan which have been offered to the United States by Japan under the Japan-U.S. Status of Forces Agreement since the Okinawa Reversion Agreement entered into force in 1972. (1) Since fishermen from Taiwan frequently intruded into territorial waters around the Senkaku Islands and made unlawful landing thereon, the Ministry of Foreign Affairs of Japan sent a Note Verbale to Ambassador of the United States of America to Japan on August 3, 1968, requesting the U.S. Government to take necessary steps to control and regulate the intruders and to prevent any recurrence of intrusions. The U.S. side replied that expulsion of intruders and other measures had been taken. The Joint Communique of Prime Minister Nobusuke Kishi and President Dwight D. Eisenhower in 1957 said in part: “The Prime Minister emphasized the strong desire of the Japanese people for the return of administrative control over the Ryukyu and Bonin Islands to Japan. The President reaffirmed the United States position that Japan possesses residual sovereignty over these islands.”. 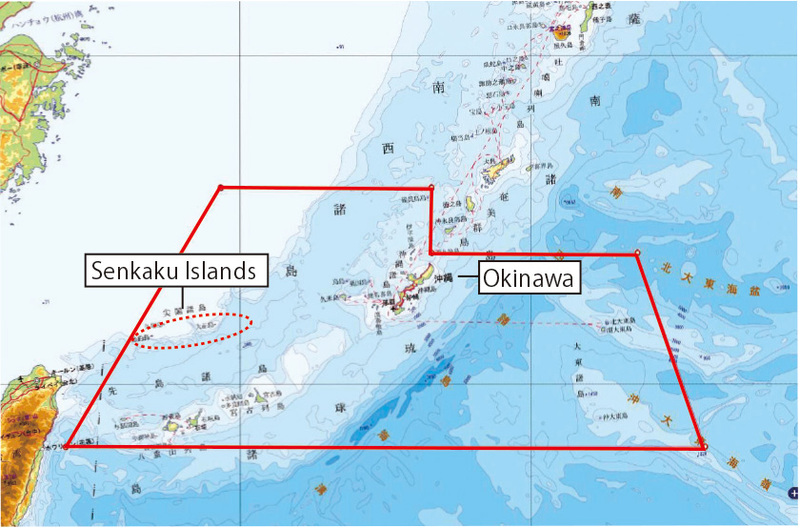 Q16China is strongly objecting to the Japanese government’s acquisition of the ownership of three Senkaku islands in September 2012. How does the Japanese government view such objection? There is no doubt whatsoever that the Senkaku Islands are an inherent part of the territory of Japan in light of historical facts and based upon international law. Indeed, those islands are under the valid control of the Government of Japan. There exists no issue of territorial sovereignty to be resolved concerning the Senkaku Islands. The Government of Japan’s acquisition of the ownership of the three Senkaku islands will not give rise to any problem with another country or region. On the other hand, it is true that the Chinese government is making its own assertions on the Senkaku Islands. While Japan does not accede to such assertions, the Government of Japan has been explaining to the Chinese government from a broad perspective that the recent ownership transfer was aimed at maintaining and managing the Senkaku Islands peacefully and stably on a long-term basis and that the transfer is nothing more than returning the ownership from a private citizen to the Government, with which the ownership rested until 1932. The Government of Japan, as a country sharing responsibility for the peace and stability of East Asia, will continue to call upon the Chinese side to behave calmly without losing sight of the overall relationship between the two countries. It is a matter for deep regret that violent anti-Japanese demonstrations took place in various parts of China, with some people throwing rocks and debris at Japanese diplomatic missions, physically injuring Japanese citizens, and setting fire on, damaging and looting facilities of Japanese business establishments. Regardless of reasons, violent acts must never be tolerated, and any dissatisfaction resulting from difference in views must be expressed in a peaceful manner. Japan is asking China to ensure the safety of Japanese citizens and businesses and to compensate properly the damage incurred by Japanese businesses.